29 November 2018, 12:12 p.m.
Europe will take second place with 18 percent. North America will take an 11 percent share, while Latin America will fall behind with just three percent. Over 42% of Chinese homes will have access to 1Gbps services thanks to “a series of massive build-outs led by China Mobile”. That’s an impressive number considering China’s ~1.4 billion population which pales in comparison to North America’s ~364 million. 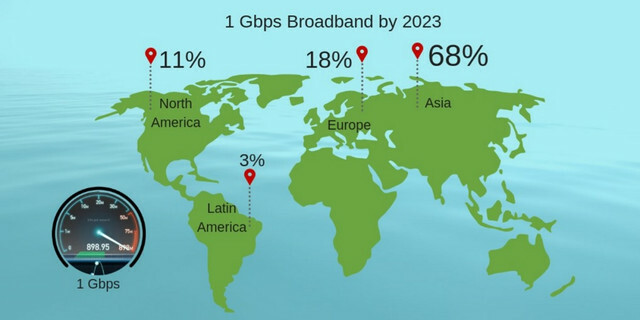 Most of the world is expected to use fibre technology, while the US is expected to predominantly use DOCSIS 3.1. “Laggards in percentage terms will include the United Kingdom and Germany and much of Latin America,” said Rethink. Countries like the US suffer from a small number of large private broadband companies which avoid competing with each other in order to form localised monopolies. China’s state-owned telecoms businesses – China Telecom, China Unicom, and China Mobile – are focused on delivering gigabit broadband to as many as possible, as fast as possible. The current major barrier to gigabit uptake is cost. Rethink believes in around two years “1Gbps broadband will become commonplace and inexpensive" and notes the percentage of users convinced to upgrade will move from five percent a year, to around eight percent in later years. Finally, the report believes technologies which deliver increased speeds over existing infrastructure – such as G.fast – will quickly become obsolete as more buildings opt for full fibre connections. Interested in hearing industry leaders discuss subjects like this? Attend the co-located IoT Tech Expo, Blockchain Expo, AI & Big Data Expo and Cyber Security & Cloud Expo World Series with upcoming events in Silicon Valley, London, and Amsterdam.